As 1969 drew to a close, publisher IPC's line-up of comics lacked any real rivals to D.C. Thomson's range of humour titles. Whizzer and Chips changed that. At the time the mighty Beano and Dandy were 4d (four pence) each for 16 pages. 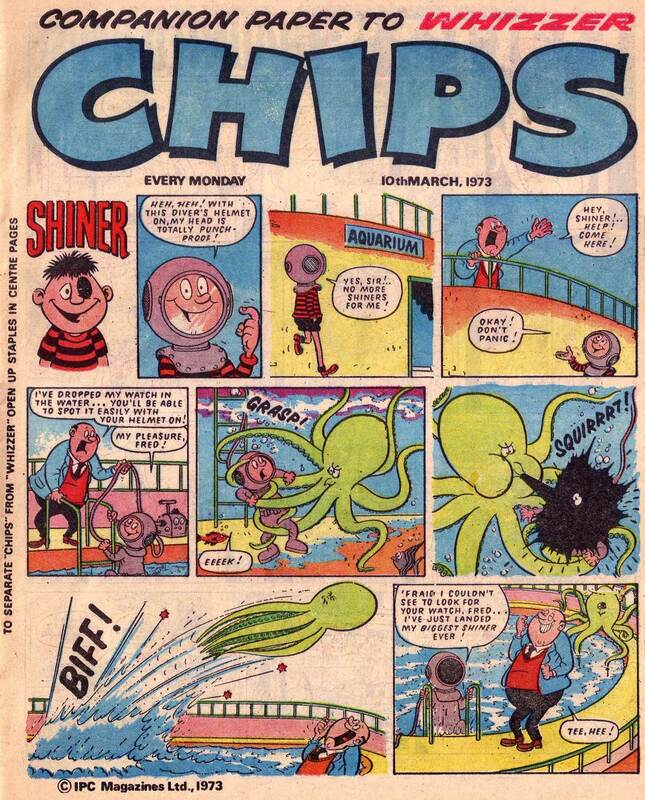 Instead of competing at the same level, Whizzer and Chips gave readers 32 pages for 6d but with the gimmick that it was two comics in one (16 page Chips sat in the middle of 16 page Whizzer). This proved to be a success and the experiment was later repeated with Shiver and Shake and the football title Score 'n' Roar. Cover star of Chips was Shiner who was constantly in trouble with his mum for getting a black eye. The strip was drawn by the prolific Mike Lacey (son of adventure strip artist Bill Lacey) who also produced work for Buster, Knockout, Monster Fun, Cor! !, Whoopee!, Jackpot, Shiver and Shake, Wow and Cheeky Weekly. This example from 1973 has a twist on the usual outcome and features a great cartoon octopus by Lacey. (Click for larger image). This blog is intended to showcase the many ways scuba diving has been depicted in various printed media. Previously, a version of this blog appeared on the website of a dive school but I decided to move it here. All images are used for review purposes and remain the copyright of their respective holders. No infringement is intended. Thanks to the original scanners. I work in conferences and events as a video engineer. I'm also an occasional diving instructor. I decided to combine my interest in comics & illustration with my love of scuba and the Art of Diving was born. 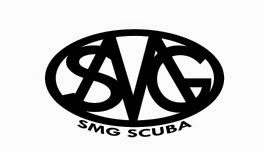 SMG Scuba is a PADI facility based at Tonbridge School Centre. The Art of Diving recommends Otter Drysuits. Interested in early scuba gear? Dive in to the Art of Diving archive!